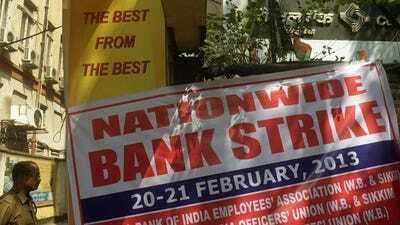 India’s public-sector banks and many government offices were shut Thursday on the second day of a general strike called to protest against the government’s planned pro-market reforms.Eleven unions called the strike in protest at the measures which they condemn as “anti-poor” and likely to cost jobs and raise prices. While the impact of the stoppage was patchy and felt mainly in heavily unionised state institutions, analysts said it underscored discontent among workers. “The government must sit down with the workers and hear them out because it cannot afford to ignore this class any more with general elections due in 2014,” Shubha Singh, a New Delhi-based political analyst and writer, told AFP. The reforms include opening the retail, insurance and aviation sectors wider to foreign investment in a bid to spur a sharply slowing economy. They also involve raising prices of subsidised diesel and reducing the number of discounted cooking gas cylinders to reduce a ballooning fiscal deficit. Leaders of two main leftist parties said they were boycotting the opening session of parliament on Thursday in solidarity with the strikers. The government is already under pressure over an economy growing at its weakest pace in a decade and widespread allegations of corruption. The Associated Chambers of Commerce and Industry has estimated losses from the two-day stoppage at more than 200 billion rupees ($3.7 billion). Attendance at government offices was thin and many education institutes were closed as teachers’ unions joined the strike. Universities cancelled exams set for Thursday. Operations at India’s state-run banks were also halted. Top carmaker Maruti, which has a history of labour unrest, declared a holiday to avert trouble while two-wheeler manufacturer Hero MotorCorp gave workers a day off. The All India Trade Union Congress said millions of workers were taking part in the strike and called on them to keep up pressure on the government, already facing a hostile opposition in parliament. But most privately-run factories reported normal operations and financial markets were open in Mumbai. Police said dozens of people were arrested after protests turned ugly in an industrial hub near New Delhi on Wednesday when a mob threw stones, vandalised factories and set several vehicles on fire to enforce the strike.